What is oral and dental hygiene? What are the results of good dental hygiene? What is the purpose of dental hygiene? How can one maintain good dental hygiene? Pink gums that do not hurt or bleed while brushing or flossing. A mouth free from regular episodes of bad breath. What are the symptoms of improper dental hygiene? What are the potential consequences of improper oral hygiene? Corrodes the tooth enamel over time and results in holes or cavities in the tooth. Irritates the gums, resulting in bleeding, which leads to foul breath. The cavities are usually cleaned and refilled with an inert material by the dentists to retain and restore the teeth as well as protect them from further tooth decay. If left untreated, it can result in loss of entire teeth. Tartar or calculus - Constant accumulation of plaque as a result of irregular brushing and flossing results in the hardening of plaque into a yellow or brown mineral deposit called tartar or calculus. As a result of its crusty and rough surface, teeth then become ideal locations for further plaque growth. 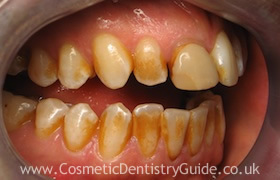 Tartar leads to gum disease when it is formed below the gumline. If treated with adequate dental care, it is reversible. If ignored, it can lead to a more serious and advanced form of gum disease called periodontitis. Periodontitis. This is advanced gum disease, which leads to the destruction of structures supporting the teeth, including the bone; this causes the loosening of teeth, requiring their removal as a result. The signs of the condition are red, swollen, bleeding gums that shrink away from the teeth. 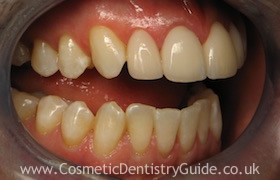 The resulting widening spaces between the teeth and exposed root surfaces are highly vulnerable to decay. Proper dental and oral hygiene will prevent the formation of plaque, which, as explained above, is the main factor that leads to gum disease and tooth decay. Parents must guide children as to the proper dental hygiene methods they should practise daily. You can also seek your dentist’s advice about the proper oral and dental hygiene practices to be followed. Use regularly after brushing and/or flossing to kill plaque-forming bacteria, and especially if you have bad breath. Flouride protects and strengthens your teeth by binding with enamel. Use fluoride in toothpaste, fluoridated drinking water or dental treatments, or take a fluoride supplement. Taking care of your teeth begins in infancy and will be a lifelong concern. There are some precautions that must be taken at various life-stages and under various conditions. Infants – use a moist cloth or a soft toothbrush to wipe the tooth clean. Use only very limited amounts of toothpaste, especially if it contains fluoride, as too much of the ingredient can be toxic to infants. Adults with partial or full dentures or bridges – you must maintain proper dental and oral hygiene as instructed by the dental hygienist or dentist in order to prevent gum disease. Denture users must regularly visit their dentist to realign and adjust the dentures as required to prevent red and swollen gums. Must be done thoroughly but not too vigorously, as rough movements can irritate or damage sensitive oral tissues. Sore or bleeding gums in the first few days after flossing are normal. However, any bleeding, sore or abnormal condition that last beyond one week should be reported to the dentist. Eating a balanced diet plays an important role in dental health. A balanced diet includes all the main food groups: fruits and vegetables, milk products, meat, fish, etc. Foods with a high concentration of sugar - cakes, ice cream, honey, etc. Acidic drinks with a low pH value - can damage the tooth enamel. Sticky foods – these do not get washed away from the tooth surface easily by the saliva, hence increasing the exposure of teeth to sugar and acids and, consequently, tooth decay. Foods high in fibre, such as fresh fruits and vegetables - they increase the saliva flow, which neutralises acids, helping to clean the teeth of food particles and sugars during chewing. Rich foods without sugar - milk, yoghurt, rice, meat, fish, fruits, etc. Fruits and vegetables that contain a high volume of water - pears, melons, celery, and cucumbers. Consume sweets only with main meals and not between meals - saliva production is increased during main meals, thereby neutralising most of the acids and lessening the hazard. Avoid sugary or acidic drinks between meals, and drink milk or water instead. Finish your meal with yellow cheese - this helps neutralise the acids in the mouth, especially after the consumption of sweet foods.